Our military job seekers possess experience unmatched by peers, have demonstrated their performance in stressful situations, and are graduates from the nation's military academies, top colleges and universities, and technical schools. 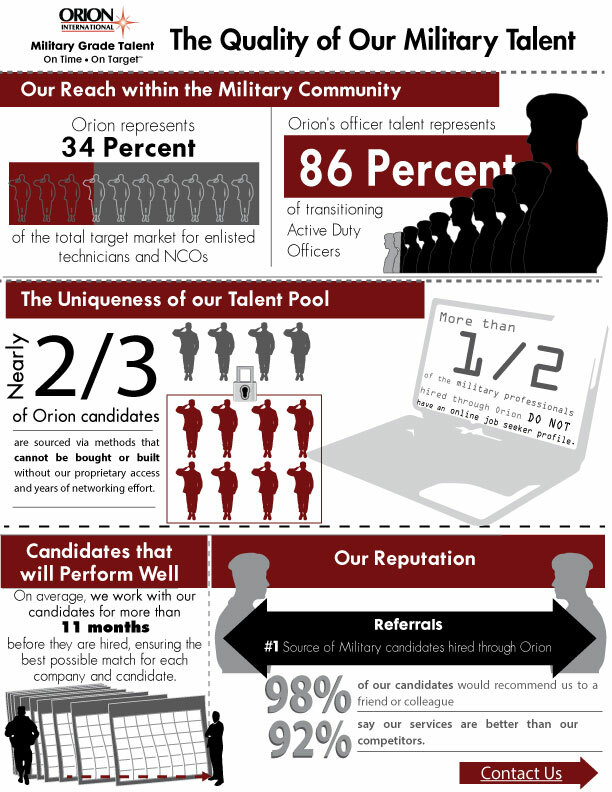 Orion candidates represent the highest quality of job seekers available. We screen and select our candidates from the top 10% of Junior Military Officers, Noncommissioned Officers, and Technicians leaving the Armed Services, and we have a constantly replenishing database of approximately 30,000 candidates ready to work within the next 90 days. Our Recruiters perform a multi-tiered screening process, verify our candidates' backgrounds, and check their references, all prior to presenting them to our clients. Junior Military Officers (JMOs) have earned a BS or BA in Engineering, Management, or Humanities. Many have advanced degrees. Orion's JMO candidates have served in the military between 4 and 10 years and possess leadership experience unmatched by their civilian peers. JMOs are ideal for positions in Engineering, Leadership, Operations Management, and Sales. Noncommissioned Officers (NCOs) are senior enlisted personnel in a direct leadership role, with 7 to 20+ years of military experience. NCOs are the primary military leaders responsible for executing the mission and training military personnel. They have extensive training in leadership and management, as well as combat, service-specific and specialized technical training. Many have college degrees. NCOs are ideal for Technical, Maintenance, and Field Service Management and Supervisory positions. Enlisted Technicians possess strong technical qualifications and training as Electrical, Electronics, and Mechanical Technicians. They have served in the military at least 3 years, and have world-class technical training, hands on experience, and excel in any situation, no matter how difficult. They are ideal for positions in Electrical, Electronics, Mechanical, Maintenance, Field Service, Operations, and Technical Supervision. In the last several years, Orion's expertise has expanded to include non-technical enlisted service members with combat arms Military Occupational Specialties including Infantry, Armor, and Artillery. These enlisted service members typically have pay grades ranging from E-4 to E-7, and possess Operations Leadership experience, discipline, outstanding work ethic, and relocation paid for by the military. They are ideal for positions in Operations, Sales, and Entry Level Leadership. Learn more about the Quality of our candidates and the Request Information from our Client Service Team.